What Better Way to Celebrate a Meal Than Boiling, Grilling or Baking Hot Dogs! This book will change your life. The days of plopping a hot dog on a bun, squirting a squiggle of mustard on it and calling it lunch are over. Chicago dogs: Topped with schoolbus yellow mustard, dark green relish, chopped raw onions, tomato slices, celery salt and a poppy seed bun. Tex-Mex dogs: Toppings include salsa, Monterey Jack cheese, and chopped jalapeno peppers. Pigs in a Blanket: Wrapped in pastry and baked in the oven. Baltimore Frizzled: Split open and then deep-fried. Kansas City dogs: Sauerkraut and melted Swiss cheese served on a sesame seed bun. New York City dogs: Replete with steamed onions and pale yellow mustard sauce. Coney Island dogs: Topped with the legendary spicy meat mixture. The Francheezie: A jumbo hot dog split down the middle and filled with either Cheddar cheese or Velveeta. Wrapped in bacon and deep-fried, it's served on a toasted bun. Southern slaw dogs: Served with coleslaw on top. Corn dogs: Carnie dogs, skewered with a stick, dipped in corn bread batter and then deep-fried. Tex-Mex dogs: Toppings include Guacamole purée, salsa and Monterey Jack cheese. 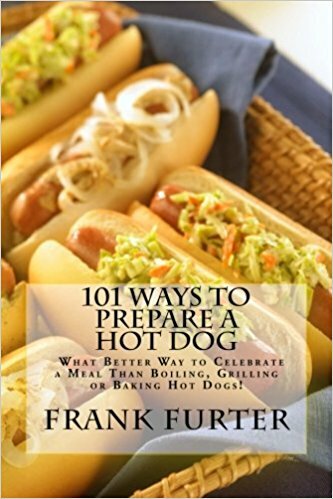 The international section of the book details how hot dog aficionados from around the world prepare hot dogs, recipes from: The Basque Country, France, Germany, Argentina, Colombia, Japan and Australia. Besides the multitude of recipes for assembling hot dogs we've included recipes for condiments such as homemade mustard, Coney Island Sauce, Salsa Rosada, Guatemalan Chirmol, Sauce Américaine, Flo's Hot Dog Relish,Coca-Cola Caramelized Onions, Hot dog Slaw, Marmet Famous Yellow Slaw Texas Yellow Cold Slaw, Rémoulade, Utah Fry Sauce, Hawaiian Salsa and Guasacaca to name but a few. What better way to celebrate a meal than boiling, grilling, steaming or baking hot dogs and then jazzing and them up with Swiss cheese, fancy mustard, piccalilli or a dozen other fancy condiments.